Minor League Player of the Day: Billings 2B Avain Rachal: He went 3 for 4 with a HR, a 2B, a BB, and a SB. Five different players singled to account for all of the Bat’s offense in the shut out. Chad Rogers got the loss as he went 5 IP and allowed 5 R on 8 H and 2 BB with 3 K. Kanekoa Texeira and Nick Christiani each added 1 IP of scoreless relief. Mike Costanzo went 1 for 2 with a HR and a BB. Ryan LaMarre and Jon Moscot each doubled. Jon Moscot got the win as he went 5 IP and allowed 1 R, 0 ER, on 2 H and 1 BB with 4 K. Jamie Walczak added 1 IP of scoreless relief. Trevor Bell picked up his 15th save with 1 IP of scoreless relief. Corey Wimberly went 1 for 2 with a 2B and a BB. Brandon Short homered. Chris Berset doubled. Daniel Renken got no decision as he went 4 IP and allowed 1 R on 4 H and 2 BB with 6 K. Parker Frazier got the win with 1.2 IP of scoreless relief. Bakersfield – No game scheduled. Zach Vincej went 2 for 3 with a HR. Jon Matthews went 2 for 4. Ismael Guillon got the loss as he went 6 IP and allowed 2 R on 4 H and 1 BB with 3 K. Jesus Adames added 1 IP of scoreless relief. Avain Rachal went 3 for 4 with a HR, a 2B, a BB, and a SB. Adam Matthews went 2 for 6 with a HR. Jose Ortiz went 2 for 5 with a HR. Carlos Sanchez went 2 for 6 with a 2B and a BB. J. R. Reynolds went 2 for 6. 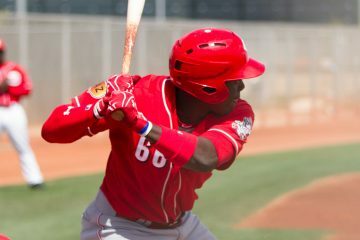 Aristides Aquino homered. Pedro Diaz got no decision as he went 4 IP and allowed 2 R, 1 ER, on 5 H and 1 BB with 1 K. Scott Brattvet added 2 IP of scoreless relief. Oswaldo Mieres got the win with 1.2 IP of scoreless relief. Though he took the loss yesterday I really like the stats coming out of Dayton for Guillon during this second half of the season. Been to several Dragons games this year but I’ve only seen him pitch once. He was roughed up that night. Now that he is back on track I’d like to get up to see the Dragons specifically to see him pitch. We’ve talked about Zach Vincej several times this year, but I really like this guy. A 37th round college player in 2012’s draft who’s putting his name in front of the front office by playing solid defense at short and putting up respectable numbers at the plate. 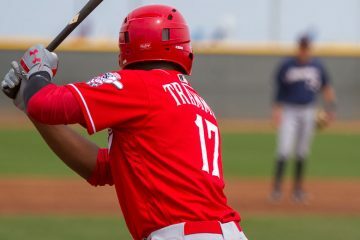 While I’m not willing to call him a prospect, I like that he’s taking this opportunity to get played to play baseball and making something of it. @Shchi Cossack: I don’t know why I do things like that. I’m old. Looks like the Bats could use some of Mike Costanzo’s offense.